Which will be remember'd for a very long time." Once a fishing village and ferry port Broughty Ferry lies four miles to the east of Dundee City Centre situated on the north bank of the Firth of Tay. It became the "Richest square mile in Europe" where the wealthy Dundee jute barons built their mansions. The town is centred round the 15th century Broughty Castle built to guard the entry to the Tay and now home of a whaling and military museum. It was incorporated into the city of Dundee in 1913. Ferries operated from here from the earliest times although the present structure was built by the railway in 1854 to provide the very first roll-on roll-off ferries. This created a rail link between Dundee, Edinburgh and further south. A spur line ran from the Dundee to Arbroath Railway, where New Road is now, down to the Harbour where 14-16 trucks would be run down a ramp on to the ferry. Originally opened in 1878 it had a catastrophic collapse just a year later and 75 people aboard a train perished in the water. Much discussion over the cause has taken place but its largely blamed upon the pillars not being built as designed due to the bedrock being much deeper than estimated. Re-built and opened in 1887 it remains in service and fantastic views can be had from on the water. year, but estimates suggest that the grey seal population peaks at about 2000 and the common sea about 600. Naturally inquisitive not many trips are made without one popping its head on the water nearby. The Tay Dolphins were part of the Moray Firth Pod of 200 who made regular trips down the coast. Approx 60 individuals are thought to be resident in the Tay now. When they appear they often come very close to see what's going on. 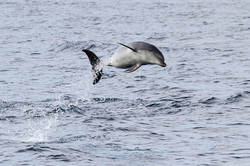 We adhere to guidelines for dolphin watching etiquette and always remain respectful to them and their environment.